Bathers, it’s one of lifes big challenges(! )but it never going to go away so I say bikinis,tankinis,monokini,burqini,one piece, whatever rocks your boat! Although,like you say,once you get to the beach, pool, waterpark you look around and wonder why you ever worried about your bather choice, nobody else seems too! Oh god – each year I find the whole bathers thing gets worse!!! 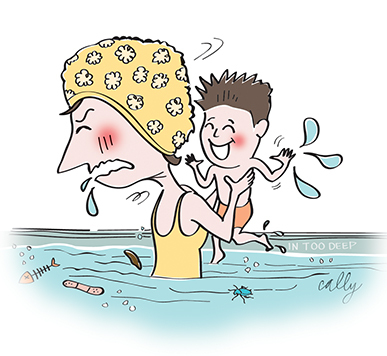 As for public pool – I’m with you Sam – plus myself and my girls have been kicked out of the toddlers pool(in those early days) too many times due to some random poo floating or sitting at bottom of the pool ! I truly hope you weren’t the cause of the floater!!! Knowing you pretty well I’m pretty sure you weren’t the culprit but then again!!! Once I let my hubby read this – I think I will have my new in ground pool plans underway!